If you just go jump out in the middle of the ocean, it isn't likely that you will run into a dolphin. If, by a miracle, you do run into a dolphin, it is even less likely they will get close enough for you to hug. If, by an even greater miracle, you are able to hug this dolphin, please let us know as we will follow you where you go next. For the sake of success rate and to avoid questioning your sanity, we recommend that you take this opportunity to get up close and personal with one of the oceans' most cunning creatures! Your program begins with an explanation on the lifestyle of dolphins. With a better understanding and a life jacket strapped on, you will enter the water with your trainer by descending a set of stairs to a submerged platform. The water will be waist deep and provides the perfect setting to interact with some of the smartest animals in the world. - This program includes a 15-minute briefing and 30 minutes with the dolphins. - Lockers are included in the price of the tour. - Please bring cash or credit card if you wish to purchase photos. - After disembarking the cruise ship, you will need to take a taxi to the dolphin swim location. It will take approximately 10 minutes and costs about 10-15 USD each way. 10:00 AM (0.75 hours) Check in 30 minutes early. 02:00 PM (0.75 hours) Check in 30 minutes early. 12:00 PM (0.75 hours) Check in 30 minutes early. 03:00 PM (0.75 hours) Check in 30 minutes early. - Please bring a towel. They are not provided. 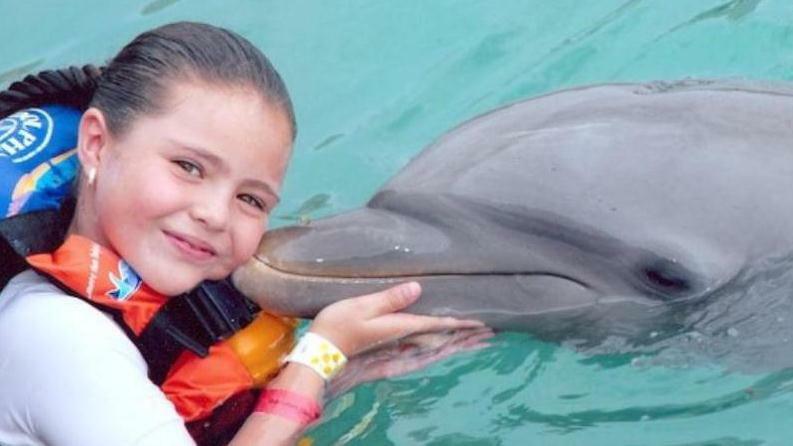 - For safety reasons, no cameras are allowed in the dolphin encounter area. Professional photos will be available for purchase. - 1 to 5 year year-olds are free but must swim with a paying adult. 6 and 7 year-olds pay the regular price but must swim with a paying adult. One adult is required to participate per child. 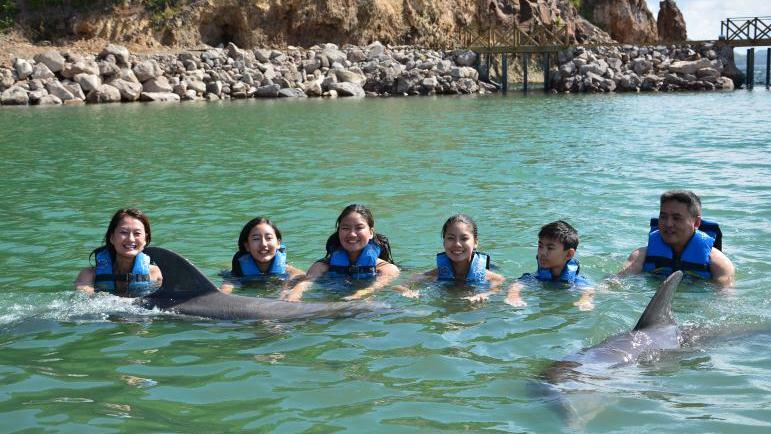 - Do not wear sunblock while swimming with the dolphins. - Jewelry, watches, rings, bracelets, or any object that might scratch the dolphins are not allowed. - Non-swimmers are welcome. Each person is required to wear a life jacket. - Pregnant women are not allowed to participate. - If you are interested in going to the dolphin swim location as an "observer" there is no charge. Please be aware that the area where you are able to wait is about 10 Meters from the dolphin swim spot and doesn't provide the best vantage point for pictures. Cameras are not allowed in the dolphin swim area.